Lately I've been trying to expand my studying of the gospel. Of course, we are supposed to read the scriptures and I can personally attest to how much that strengthens my testimony and love for this gospel. But there is also so many other sources we are able to study and learn from and be uplifted by. 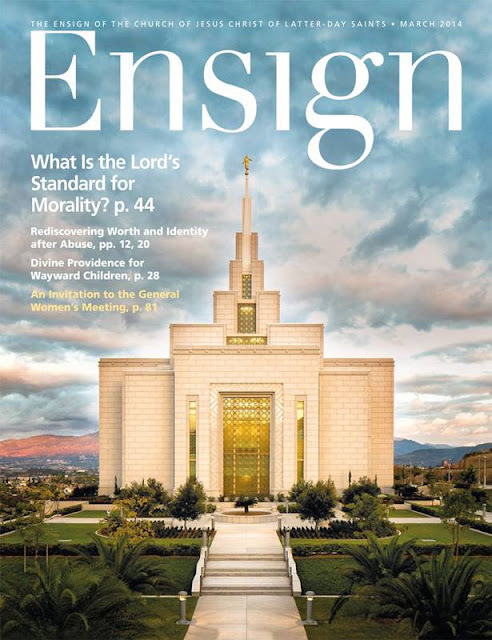 Confession time; I have never actually really read the Ensign. I grew up reading the New Era and the Friend, but as an adult I have never read much from the Ensign. But the past couples months I have been trying to make sure to read at least one article from it every day. I LOVE IT! Guys! I can't believe I missed out on it for so long. And you don't have to pay for a physical subscription to have access to it (which I foolishly used to think was the case) you can access it for free online, or through the LDS Library app. Of course the physical copy is nice to have too (and is actually really cheap) but online and free works great! I read it almost entirely through the app while on the go and read a little bit throughout the day whenever I have a free second. It really helps uplift my day and add a little light to my heart when I'm having a hard time, on top of reading the scriptures. My absolute favorite parts are bold! "The pioneers serve as a good reminder of why we must break away from the temptation to isolate ourselves and, instead, reach out to help each other and have compassion and love for one another." "The pioneers, who sacrificed so much, went without and hungered for even the most basic of necessities to survive. They understood that happiness doesn’t come as a result of luck or accident. It most certainly doesn’t come from having all of our wishes come true. Happiness doesn’t come from external circumstances. It comes from the inside--regardless of what is happening around us." "Each time you enter the temple, you can feel of His Spirit and receive additional revelation and understanding while providing the necessary ordinances for others. You will understand and receive assurance of your eternal existence and the unending power of your covenants. If we were not eternal beings, the temple would have no significance." "The promises in the temple are rich and noble. They are the “great favors” and “great blessings” (3 Nephi 10:18) that our Father has reserved for you personally. So smile when you think of the temple." Thus, the crowning event of the Creation was not just when Adam and Eve were created in the image of their heavenly parents but when they were sealed in eternal marriage like their heavenly parents. From the beginning, marriage between a man and a woman was ordained of God and established as the ultimate purpose of our creation. Living worthy of a temple recommend, receiving temple ordinances, and being true to our covenants gives us the focus and vision to stay on the covenant path. When our youth live worthy to perform baptisms for the dead, their lives will be in order. The most important thing you can do is to make sure your children and those you nurture know that you love them. Love is the key ingredient to happiness. The Lord God is indeed a sun and shield and will give grace and glory. No good thing will be withheld from them that walk uprightly (see Psalm 84:11). My prayer is that you may reap the rewards of righteousness as you faithfully follow our Lord and Savior Jesus Christ. Joseph translated an astonishing 588 pages of the Book of Mormon in what was, at most, 65 working days. It is also instructive to note that the translation of the King James Bible took 47 trained scholars, working in languages they already knew, seven years to complete. But the greatest miracle in all of this is not found in how fast things were accomplished but in the complexity of what was produced in that highly demanding time frame. You have a Brother who watches over you, ready to rescue you and advance your service with arms far stronger than your arms--far stronger, in fact, than all other arms of the flesh combined. Those arms are there to sustain and bless you, “in every time of trouble” (D&C 3:8), no matter how alone and discouraged you may feel. Therefore, as you move forward with your life, trust in those arms and “be strong and of a good courage, fear not, nor be afraid … for the Lord thy God, he it is that doth go with thee; he will not fail thee, nor forsake thee” (Deuteronomy 31:6). Joseph discovered this and changed the world. You can too. Christ’s gospel and His Church help us overcome the tendency of the natural man to sag in sin and selfishness and to wallow in worldly things that harm us spiritually. By living the gospel and keeping covenants, we are lifted up to greater joy, peace, and service.